This topic contains 19 replies, has 16 voices, and was last updated by Austin 2 years, 2 months ago. If your in the market for a high end half sheet sander there are 2 very good options that really stand out. The Festool 567696 RS 2 E Orbital Sander and the Bosch OS50VC 1/2-Sheet Orbital Finishing Sander. Both of these European made sanders are high quality and very similar in a lot of ways. 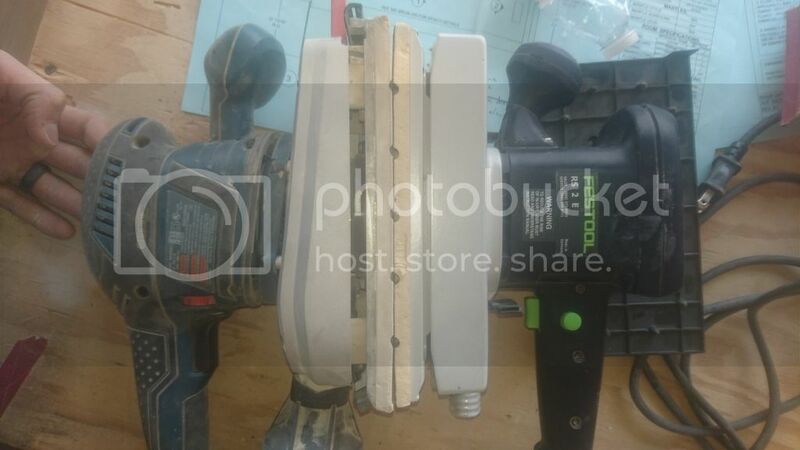 I received the Bosch half sheet sander as a redemption on this website and used that opertunity to put it up against the Festool sander. First thing that I did with both sanders is cut a piece of paper on half and put each half on each sanders. This isnt a difficult task on either of these sanders and it doesn’t take a rocket scientist to figure out how to put paper on. With the Festool there are 2 levers that are flipped up that releases a bar on each side that grips the paper with some teeth. You stick the paper in and flip the lever and repeat for the next one. Or you can use hook and loop paper that attaches to the pad. The Bosch makes it a little easier to attach standard paper. Instead of 2 levers there is one lever and one button each with a number. The button in the back has the number 1 by it denoting that it’s the first side to put the paper on. The button is spring loaded so you hold it down while inserting the end of the paper. Also there are 2 little nubs that stop the paper so you don’t put it in to far. These are very much appreciated because a couple times I inserted the paper to far into the Festool and didn’t have enough paper for the other side to be attached. The front of the Bosch has a lever that not only clamps the paper down but pulls it tight so that it has no slop on the pad. The Bosch does not come with a hook and loop pad although I understand that one can be found but not stocked in North America. Most if not all festools are built around dust collection and do a very good job at collecting the dust and the Half sheet sander is no exception. The Bosch doesn’t fall behind though in fact it’s a neck and neck race with no clear winner. Using regular paper holes have to be punched, with the Bosch it’s easy after the paper is attached simply set it on the plastic base supplied with the sander and all the holes are punched in a couple of seconds. The Festool has no such plate instead each hole has to be found and poked in which in reality doesn’t take much to at all. Both Sanders do an excellent job of picking up all the dust even without a vacuum. I sanded one half of a poplar board with each sander with only the dust bag attached using 120grit sand paper. After sanding I applied a piece of masking tape to pick up the remaining dust. Though not completely spotless, but close. both pieces of tape looked identical. This test repeated with a vacuum only made both pieces of tape even more cleaner than the first time but pretty much identical looking every time. A couple things to note is the supplied dust collections worked very good however the Bosch with a canister stile that has a filter inside it can be unscrewed and emptied and probably not have to be replaced for a very long time while the Festool has a paper bag that has to be pretty much thrown away when it’s full. All I can say about both of these sanders is that both of them leave very very good finishes. I couldn’t find any swirl marks in any thing that I sanded. They both do an excellent job at the ultimate goal of what they are both supposed to do. The larger pad on both leave a very flat and clean surface and gets the job done fast. If you are using a sander all day it can be tiresome on you. Bosch thought about this and put in some vibration control into their sander. Festool has done this too but the bosch is much more smother and vibration free. Look at the video below you can see how the top moves almost independently from the bottom. This makes for no harsh vibrations at all and even after sanding for hours you won’t get that pins and needles feeling you get with other sanders. The festool is still very smooth, probably smoother than any other sander out there besides the bosch. Also the bosch offers a little more ergonomically friendly grip with no hard corners and lots of rubber overmolding. Both sanders are top quality and will no doubt leave an awesome finish. The bosch comes in at around $330 with the festool coming in at a higher price tag of $410. However the festool comes with a systainer, ad the price of either a systainer or lboxx to the bosch ($50-70) and some foam or insert to keep it secure ($10-15) and the price point is really close. The bosch has the edge with its superior vibration control but in every other category it’s neck and neck. With either sander you can’t loose. Nice comparison. I will say the ergonomics of the Bosch seems much better. After using the sanding for awhile now myself it is just comfortable to use for long periods. Dust collection is amazing with the canister and you nailed it…it is very easy to dump and re-use. If you are sanding any amount of large, flat shelves, panels, or flat doors this is the sander!! Great review Austin and up against a Festool also! I’ve been eyeing sanders for at least a year now and eventually will bite the bullet. I think you have put the Bosch OS50VC 1/2-Sheet Orbital Finishing Sander at the top of my list. The canister for dust you mentioned would be a great feature to have. Nice review! 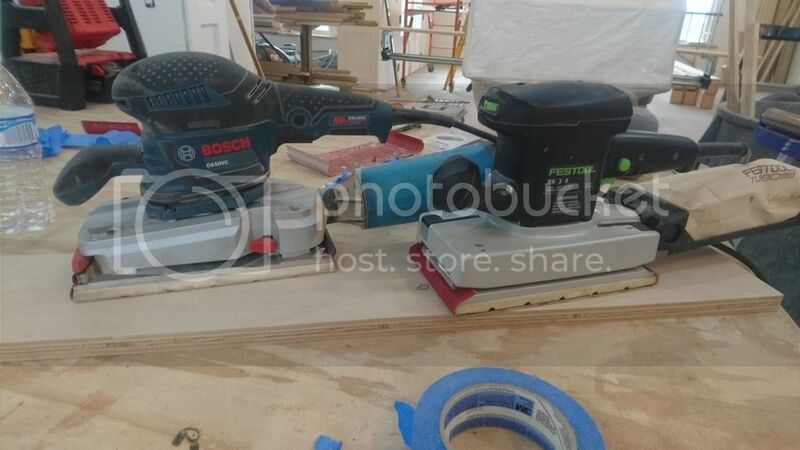 I’m glad to see Bosch doing well up against a real competitor like Festool. Awesome review Austin. Thanks for taking the time. Definitely sounds like that both sanders are really close in comparison. Didn’t expect that, I thought festool would win. Very nice review. First one I have read where a Bosch is so close to being as good as a Festool. After seeing the quality of your work in other threads I ma sure you gave both tools a good workout and are happy with the results that both gave. Very nice review. I have had my eye on that sander for while now. Nice to know it can go up against Festool. @austin wow, great review, I wasn’t aware of a couple of features you mentioned, like the way you make the holes in the paper affordable it’s placed on the sander. After reading your thorough review and the video, this is back on my list. Nice comparison between the sanders Austin. I have not used the Festool, but will agree with how well the Bosch works. Great review, Austin. The features you point out where Bosch has the advantage are really important ones; the hole punching, paper tensioning, dust collection and most of all, vibration control and ergonomics are a real deal maker. Those are the things the professional looks for in a quality tool. amazing review, leaves me satisfied I went with bosch. It was a tight race for me when I was looking at this sander. Nice job Austin. Appreciate the time you put in to compare these 2 sanders. It is now an answered question for me as I always wondered how they compared. I have the Bosch myself and have appreciated their vibration control. Very nice review Austin. 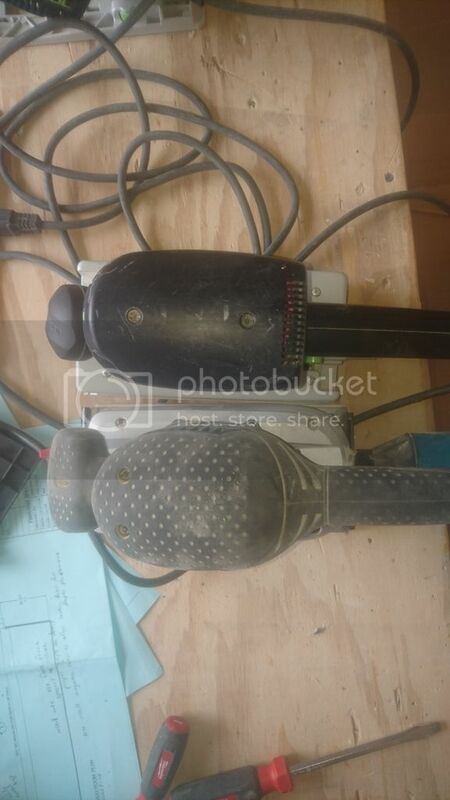 I don’t recall ever reading a side-by-side against the Festool. Thanks for taking the time! Great review, and i totally agree. However, I feel as if I can “feel” my work better with the Festool. I’m guessing that’s because of the vibration reduction on the Bosch, or I’m partial because I’ve used the Festool for so long. Either way the Bosch performs just as well as the Festool. I defiantly like the paper changing on the Bosch better, along with the supplied hole punch. 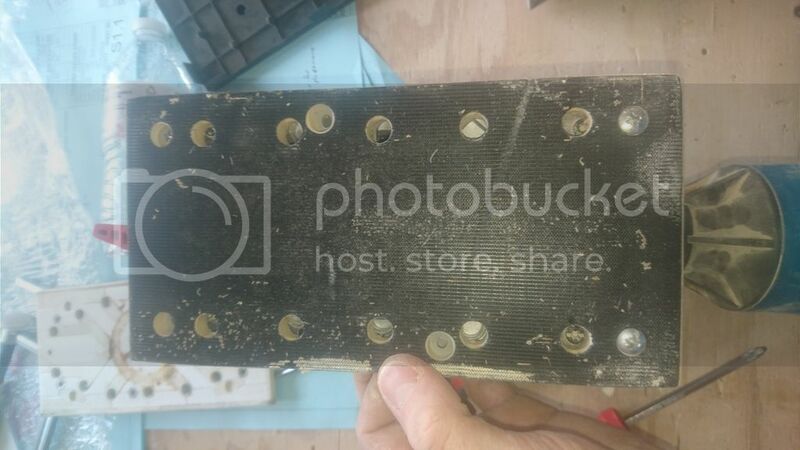 The Festool has no such plate instead each hole has to be found and poked in which in reality doesn’t take much to at all. Awesome review, @austin! 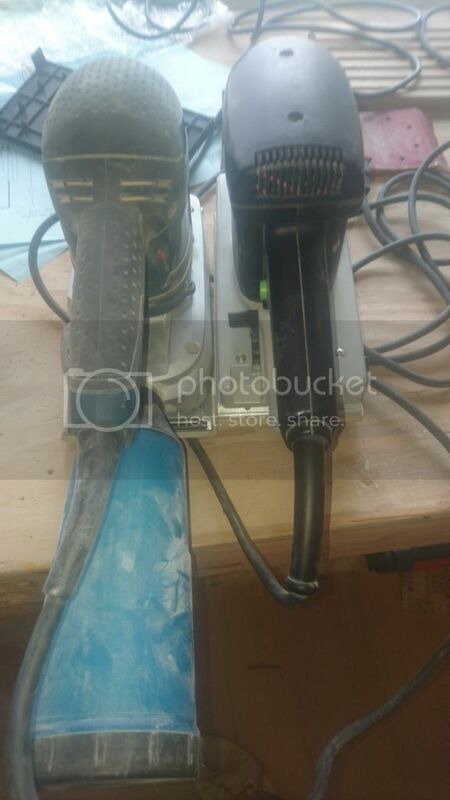 I have thought about adding this sander as I really think that a 1/2 sheet should be in everyone’s tool kit – nothing compares to flat sanding with a sheet sander. You can buy a plate for the Festool to get regular paper punched – it is an add-on, but something to consider. Sounds like the Bosch has been refined enough to make it a better machine than the Festool. Interesting that Festool sells an updated version of this outside of North America. Did you get any videos of the two running side by side per chance? The vibration control looks slick. Sure, I thought I had decided on my next redemption… and then you write and article like this. I really like the vibration control on the bosch as well as the dust container. Now i’m going to have to rethink which tool I will get the most productivity out of. you should just get this charlie, it’ll help with larger surface areas. I use mine alot, most so now on my cutting boards. Where have people bought the H&L pads? Does someplace readily import them to North America? Sounds like regular paper is not a huge deal, but I do like H&L for the speed of paper changes. I would be curious about this too. Also are you guys still aboe to use regular paper with the H&L pad or does it affect how regular paper wears?